Boo at the Zoo 2017 - Washington, D.C.
Boo at the Zoo is a Washington, D.C. favorite Halloween tradition. Children visit the National Zoo at dark and enjoy trick-or-treating, animal encounters, keeper talks, festive decorations, and haunted trails. 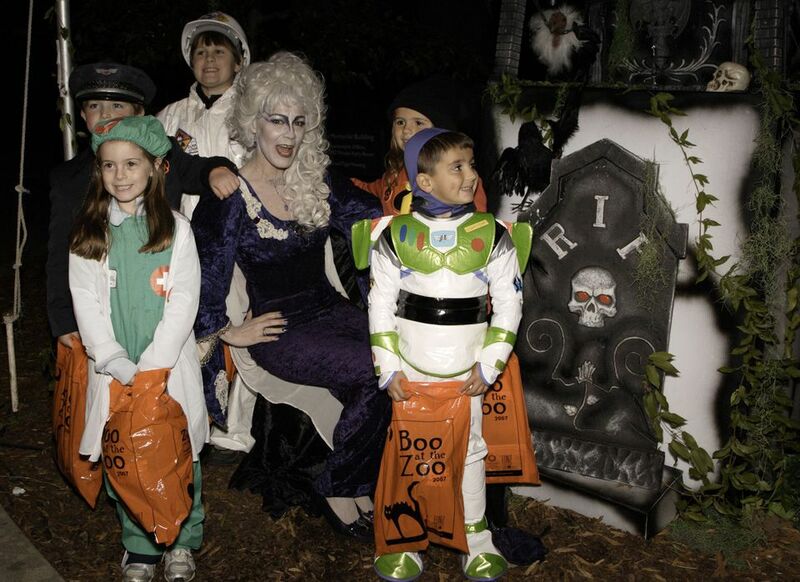 Proceeds from Boo at the Zoo benefit the Zoo’s conservation science and animal care programs. The Bird House, Small Mammal House, Reptile Discovery Center, Great Apes House, Think Tank and Kids’ Farm, Great Cats and the Elephant Community Center will be open and filled with Halloween-themed enrichment for the animals. The event is geared to children ages 4 to 12. Dates and TImes: October 20-22, 2017, 5:30-8:30 p.m. Admission: Tickets are required and usually sell out in advance. They will be available for FONZ members ($20 per person) on Sept. 1 and for non-members ($30 per person) on Sept. 15. Children ages two and up must have a ticket. You may purchase tickets at nationalzoo.si.edu. Boo at the Zoo is held rain or shine. Anyone with questions can call (202) 633-3045. Enjoy the following photos and get a glimpse of Boo at the Zoo in past years. Trick-or-treaters come to the National Zoo decked out in their favorite Halloween costumes. Boo at the Zoo is geared toward families with children ages 4-12. The National Zoo is a safe place for families to enjoy animal encounters, keeper talks, festive decorations, and haunted trails at the annual Halloween celebration. Boo at the Zoo visitors follow the trick-or-treat trail to the Homer and Martha Gudelsky Elephant Outpost, where they will learn about human/animal conflict and investigate what scientists learn by studying elephant poop. Forty treat stations are spread throughout the National Zoo. Children get to enjoy trick-or-treating while visiting with their favorite animals at Boo at the Zoo. At Kids’ Farm, special activities include reaching inside the model of a cow’s stomach or visiting the Haunted Barn. Visitors follow the haunted trails and explore Boo at the Zoo at their own pace. The Reptile House is decorated with spooky spiders for Boo at the Zoo. Check out some of the great Halloween costumes at Boo at the Zoo. This photo of Boo at the Zoo reminds visitors that the National Zoo does important work to prevent the extinction of many species of animals. Boo at the Zoo is a Halloween party for families. 2018's Best Halloween Events in Washington, D.C.